It’s a bright morning in the Presidio in San Francisco, and Andy Goldsworthy is trudging around a muddy forest clearing as he examines felled eucalyptus trees. Sorting through the logs at the start of the two-week installation process is an arduous task. Much of the wood is gnarled instead of gracefully curved, the shape necessary for creating a flowing wooden pathway through the tunnel-like eucalyptus grove bordering the Lovers’ Lane trail. But the artist isn’t fazed. He is confident that another nearby cache of logs will yield better results. Mr. Goldsworthy, who is internationally acclaimed for his often ephemeral and unobtrusive site-specific artworks fashioned from leaves, icicles, twigs and other natural materials, has worked extensively in the Bay Area since the mid-1990s. Goldsworthy fans make the pilgrimage to the region to see works like “Stone River” at the Cantor Center for Visual Arts at Stanford, “Drawn Stone” at the de Young Museum in Golden Gate Park and “Spire” in the Presidio. Mr. Goldsworthy’s art has developed over the years in response to his growing knowledge of the Bay Area landscape and history. 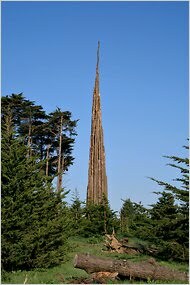 Mr. Goldsworthy first came to the Presidio in 2006 on a tour with the local art collectors Donald and Doris Fisher. He quickly became fascinated by the tension between the park’s natural beauty and its artifice. With its aromatic eucalyptus groves, rolling fog and swooping parrots, the Presidio may look like “The Land That Time Forgot,” but it was largely a barren sand dune before soldiers planted trees there in the late 19th century. The military’s landscaping efforts were not wholly successful: Planted too close together, the cypress trees near Arguello Gate are now dying, leading to a long-term reforestation project. The cypresses planted among rows of non-native eucalyptus near Lovers’ Lane fared no better; today there are empty corridors where they once stood. Visible for miles, “Spire” is unlike most of Mr. Goldsworthy’s outdoor artworks, which generally avoid making a big statement. Owing to the complex logistics involved in erecting the structure, it is also one of his more expensive projects. “Spire” cost the donor, the For-Site Foundation, about $750,000 to build. “The project took 12 days to install, but we were prepping for five weeks before that and stayed for a month afterward to do the drainage system,” Jacob Ehrenberg, an assistant to Mr. Goldsworthy, said. Mr. Goldsworthy hopes to achieve a similar result with “Wood Line,” a work that aims to draw attention to the missing cypress trees in the eucalyptus grove by weaving a curvaceous trail on the ground, in contrast to the rigid lines where they once stood. Works created a few years ago reference the region’s volatile plate tectonics, like “Stone River,” which is built from sandstone bricks fashioned from rubble from the 1906 earthquake, and “Drawn Stone,” which features a jagged crack running through otherwise solid ground. But the artist’s more recent pieces, like those at the Presidio, reflect a subtler understanding of the effects of time on Bay Area geography. The detailed knowledge of how to source and work with the Presidio’s natural resources to make the biggest visual impact is the result of years of immersion in the region.